This is a page which: needs content. You can help the ISOGG Wiki by contributing to it. More pages that need help similar to this one are here. Haplogroup R1b (R-M343) is the most frequently occurring Y-chromosome haplogroup in Western Europe and the most common haplogroup in the genetic genealogy databases. R1b1a2 (R-M269) is the dominant branch of R1b in Western Europe. When you take a standard Y-chromosome DNA test with a company such as Family Tree DNA you will be given a base haplogroup assignment such as R1b1a2 (R-M269). It is necessary to order additional SNP testing to confirm which subclade of R1b you belong to. It is sometimes possible to predict the R1b subclade from a 67-marker Y-STR haplotype. If the participant has close matches at 67 markers the prediction can sometimes be informed by the SNP status of his matches. If the subclade can be predicted with reasonable confidence then single SNP testing can be ordered from Family Tree DNA's à la carte SNP menu. Otherwise it is necessary to order a full SNP test for confirmation of your SNP status. SNP status can also be confirmed with the 23andMe test though this incorporates a much smaller range of Y-SNPs and will not provide such a detailed haplogroup assignment. As a result of the rapid population expansion in the last 4000-5000 years some of the lineages within R1b1a2 have experienced convergence of STR vlaues. As part of the random mutation process more distant lineages have moved closer together producing coincidental matching haplotypes. If you have a lot of matches with different surnames SNP testing is recommended to eliminate such coincidental matches. If two men are in different subclades of R1b they will be on different sub-branches of the Y-SNP tree and will not share a common ancestor within a genealogical timeframe. In some cases private SNPs have been found which have arisen within the last 500 years or so which are restricted to a single surname and its related Y-line genetic families. SNP testing will become increasingly important in surname DNA projects in the years to come. SNP testing is also of great interest for those who wish to learn more about the origins of their surname and their deep ancestry in an anthropological timeframe. All R1b men are encouraged in the first instance to join the R1b and subclades project which serves as a gateway for R1b. The administrators will be able to advise on the appropriate SNP testing and when testing has been completed will place you in the appropriate subclade project. See the Wiki page on Y-DNA haplogroup projects for a full list of R1b projects. For advice on SNP testing you can also join the R1b Yahoo mailing list where you can see a map showing the phylogenetic tree of R1b and its subclades. Note, however, that CDYa is a rapidly mutating marker, so it isn't a great marker for predicting a haplogroup. Mike Maddi cautions that "The figures for DYS390 are deceptive. Although a majority of all men who are U106+ have a count of 23 or less at DYS390, this is mainly due to one subclade of R1b-U106 - R1b-L48. Also, another smaller subclade of R1b-U106 (R1b-U198) also has DYS390=23 as its modal. However, all the other subclades of R1b-U106 have the same modal as R1b-P312 and its subclades, DYS390=24. Since R1b-L48 and R1b-U198 probably represent about 50% of R1b-U106 men, they skew the results of the table Tim presented above to make it seem that DYS390=23 is the modal for all R1b-U106." DYS492, which is found in Family Tree DNA's 38-67 marker panel, is a good predictor for U106 status. Mike Maddi reports that over 90% of the men in the R1b-U106 project have DYS492=13, but the very strong modal (well over 90%) of R1b-P312 and its subclades is DYS492=12. Each of these also has further downstream SNPs which have been identified. The U106/S21 SNP was first discovered in 2005. The SNP was first offered for testing as S21 in August 2005 by Ethnoancestry (now BritainsDNA). It was later offered for testing by Family Tree DNA as U106, the name by which it is now more familiarly known. Everyone who has tested positive for U106/S21 is encouraged to join the U106/S21 project. For general advice and discussions on U106/S21 join the U106/S21 Yahoo mailing list. The official U106 SNP tree is maintained by Raymond Wing and can be seen here. For an overview of U106 and its geographical spread see the reports from Iain MacDonald on his Recent human genetic anthropology website. Z12 is found in one branch of the Anglo-Norman surname Cruwys (variants Cruse, Cruise, Crewes, Crews). The surnames Cruwys, Cruse and Crewes are all found in the south-west of England with Crewes found mostly in Cornwall and Cruwys in Devon. The Cruise surname is found predominantly in Ireland. Z12 has also been found in an American Raney whose line is thought to be descended from the Cruses of Mississippi through a non-paternity event. Z12 has also been found in America in a Taylor with reported origins in Herefordshire, a Morlan from Illinois and a Stevens from Maryland. L148 is a private SNP (founder estimate: 575+ ybp) which has so far only been found in America in the surnames Wade, Mitchell, Crisps and Cripps. The Cripps surname is thought to originate in Bampton, Oxfordshire. Z326+ or L48+/null 425 (also known as the "null 425 cluster") was first identified by the late Leo Little who estimated its age at around 2-3,000 years. Michael Maddi now estimates the age at around 3,000 years. He maintains a map showing the known European ancestral locations of all men who have tested Z326+ or who are L48+/null 425. The map can be found here. For information about nulls see the Wiki article null value which includes a link to the Null 425 Project. 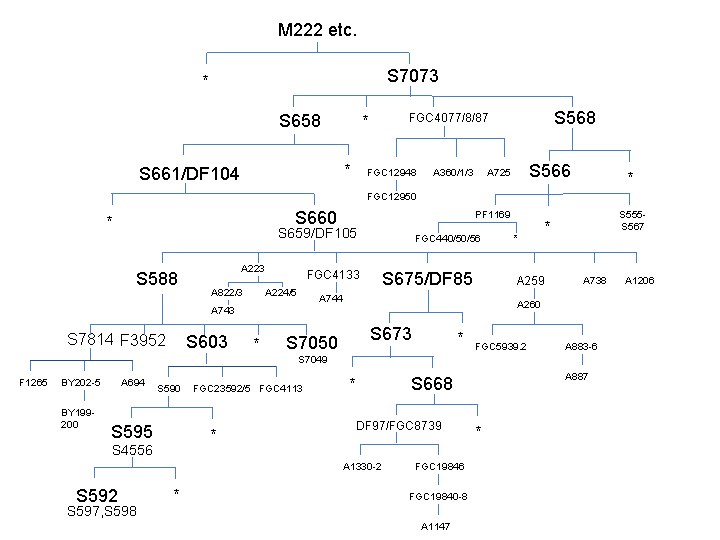 An R1b tree analysis prepared by Alexander R Williamson The chart shows showing the R1b tree and its branches together with the modal haplotype and marker frequencies for each branch. It is necessary to download the PDF file to use the Adobe Acrobat search functions and see all 168 pages of the file. ↑ 1.0 1.1 1.2 Western Atlantic Modal Haplotype Discussion thread on the Rootsweb Genealogy DNA mailing list, November 2012. ↑ David Faux. R1b SNPs - S-series and U-series equivalencies. Message on the Genealogy DNA mailing list dated 6 December 2006. ↑ David Faux. New R1b SNP Available Message on the Genealogy DNA mailing list dated 5 August 2005. This page was last modified on 2 October 2016, at 06:21. This page has been accessed 95,865 times.